Nothing takes as much teamwork and practice as spinnaker handling. Here we’ll cover the skills and techniques needed to handle and control conventional spinnakers, set from poles. 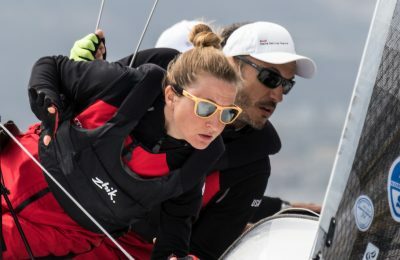 Throughout the discussion the Divide and Conquer approach to boat handling will be central: One team sails the boat as fast as possible with the sails you’ve got, while the other team handles the mechanics of the set, jibe, or douse. A trouble-free spinnaker set starts with careful packing and proper hook up. Most spinnakers can be packed by running the luff tapes to make sure the sail is not twisted as it is packed into the turtle. Large spinnakers and heavy air spinnakers can be set in stops that keep the spinnaker from filling before it is fully hoisted. Regardless of how the spinnaker is packed, the head and two clews should be secured at the top of the turtle. Before each hoist check and recheck to make sure the halyard and sheets are not twisted or fouled. A bear away set is the simplest style of spinnaker set. You raise the pole as you approach the mark close-hauled, bear away to a reach, and hoist. On most boats the sail can be hoisted from the forward hatch. Alternately the sail can be set from the leeward rail, forward of the shrouds, or from the companionway. Do not hoist from the bow; that moves too much crew and equipment weight forward. Setting from the forward hatch has several advantages. First, the sheet and guy can be hooked up prior to the race, leaving only the halyard to set just before hoisting. Second, in rough weather a sail attached to the leeward rail might wash out of the bag. 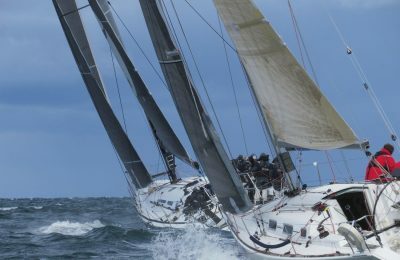 If you prefer to hoist from the bag even in rough weather, hook the bag in the middle of the foredeck rather than on the rail. To pre-rig the pole, attach the guy, topping lift, and downhaul/foreguy to the outboard end. The inboard end can be attached to the mast track if the track runs all the way to the deck (so it doesn’t interfere with the jib in tacks). Otherwise, attach the pole to the shrouds. Pre-rigging the guy simply means setting the guy through the pole jaw, making sure it is not twisted or macraméd through the lifelines. Pre-rig the downhaul with a preset amount of slack so that when you set the pole, it will be at a good height for the hoist. Attach the topping lift to the pole and then pull it back against the rig, to keep it clear of the jib during tacks. Secure the line through the jaw at the inboard end of the pole. If there is no inboard jaw (as on a dip pole rig), you’ll have to fashion another way to hold the topping lift aft. A shackle, velcro strap, or sail tie can work fine. Avoid hooks, which may grab things other than the topping lift. The final spinnaker set up should be carried out with a minimum of disruption. If you pre-rigged for a hatch hoist, then all you’ll need to attach the spinnaker halyard. Here’s how to do it. On your penultimate tack, ask the pit crew to bring the halyard tail to the rail so it can be eased as needed with a minimum of crew movement. The foredeck crew then attaches the halyard to the head of the sail. But wait, how do you quickly reach the head of the sail if it’s down the forward hatch? Remember how you pre-rigged the sheet by hooking the head and clew to the sheet shackle? Now you can retrieve the head by pulling up the sheet. Hook the halyard to the head, and then open and refasten the sheet shackle on just the clew. Be careful not to mix them up or twist them around each other. When you tack, the genoa may foul the spinnaker halyard. To prevent this, pull lots of slack in the halyard and hold it tight prior to the tack, to keep it from fouling on the spreaders. As you tack, ease out the slack again so the halyard can sag out to leeward, clear of the genoa. Bring the spinnaker on deck, hook the turtle to the rail, and hook up the sheet, guy, and halyard. Your spinnaker gear should be pre-rigged to minimize crew disruption. If you need to ask the driver or trimmers to ease the spinnaker gear, then change the way you pre-rig. Hook up the spinnaker sheets and halyard while to windward. (Usually this means while on the final port tack for a starboard tack set.) When you tack, the genoa may foul the spinnaker halyard and pull it out of the bag. To prevent this, pull lots of slack in the halyard and hold it tight prior to the tack, to keep it from fouling on the spreaders. As you tack, ease out the slack again so the halyard can sag out to leeward, clear of the genoa. If it’s windy and wavy enough that the sail may wash out of the bag on a long approach to the mark, try securing the spinnaker bag to the middle of the foredeck or at the mast base, and tie the bag securely shut after the hook up. Open the bag as you bear off to hoist. When you tack on the layline, do not immediately set the pole. If time allows, hike out (or lie still) until the boat is up to full speed. Once you are up to speed (and sure you will fetch), the foredeck crew can go forward and lift the pole into place. The pit crew, working from the rail with the topping lift tail in hand, pulls the slack out of the topping lift. There is no need to get off the rail to tail the topping lift if you bring it with you on the last tack and tail from the rail. Once the pole is up and topping lift is cleated, open the hatch and pull the three corners of the spinnaker onto the foredeck. If there’s time before the set, it is a good idea to review who will do what on the hoist, just to be sure. Also make sure the jib halyard is cleared, flaked, and ready to drop. Be ready to hoist at the mark. Unless the tactician has called for a delay, hoist as the sails are eased and the boat stands up. Until then, hike as needed to maintain speed coming into the mark. Don’t stand “at the ready,” waiting to hoist. Except in heavy air, pre-set the guy as you approach the mark. On the hoist, the guy must be pulled to the pole to prevent twists in the sail. Take the slack out of the sheet, but do not trim enough to fill the spinnaker until the halyard is at full hoist. As you near full hoist, trim the guy off the headstay to a position perpendicular to the wind. During the hoist the main and jib must be eased to maintain proper trim and speed. Once the chute is up, drop the jib. In light to moderate air the genoa can be on its way down as the spinnaker hoist tops out. In heavy air, ease the jib sheet and wait until the boat settles with the spinnaker. 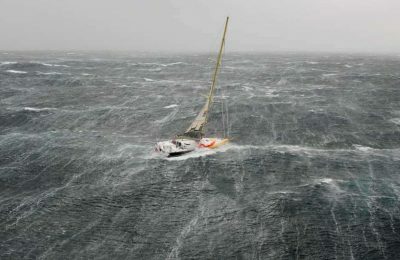 When the boat is under control, go forward to douse the jib, or leave it flying as a staysail if it adds speed! Don’t forget to close the hatch. If there is a delay with the spinnaker hoist, keep sailing as fast as possible with the main and jib to minimize the loss.